Community Radiology Associates | Montgomery Community MRI is part of a larger network of outpatient radiology centers in the Carroll, Frederick, Montgomery and Prince George’s Counties in Maryland. 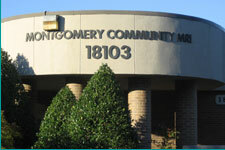 Although Montgomery Community MRI exclusively offers MRI/MRA services, we have a full-service center conveniently located right down the street on Prince Philip Drive that offers open MRI, CT/CTA, ultrasound, mammography, PET/CT, nuclear medicine, bone density measurement, fluoroscopy, and X-Ray. Our MRI center is located just 0.2 miles from Medstar Montgomery Medical Center making it convenient option for MRI services ordered by your physician. Outpatient radiology services offered at our center are on average half the cost of imaging services performed at a hospital, making it an affordable alternative to hospital imaging without sacrificing quality. Community Radiology Associates | Montgomery Community MRI provides state-of-the-art diagnostic imaging services in a caring and comfortable environment. We are early adopters of digital imaging, reflecting our long-standing dedication to advanced technology. Please contact us to find out more about the radiology services we offer and the convenient appointment times we have available to fit your busy schedule.